We will take you from Istanbul to Kuşadası with an overnight bus at 19:00. Istanbul to Kusadasi bus duration is 10 hours. You will arrive in Kuşadası early in the morning. Ephesus is the best-preserved Roman city in the Mediterranean region, and one of Turkey's top sights along with Istanbul and Cappadocia. If you want to visit a place where you can really get a feel for what life was like 2000 years ago during the glory-days of Greece and Rome, Ephesus is the place. In terms of ruins, it's better than Rome itself. Your bus from Istanbul arrives in Kusadasi early in the morning. 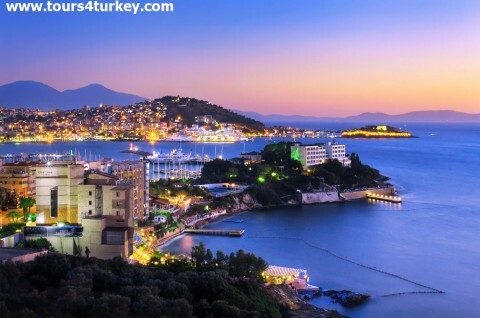 Tours4Turkey Travel Agents will meet you upon arrival and transfer to the hotel for check-in. After check-in you will depart for a fully guided Ephesus Tour. 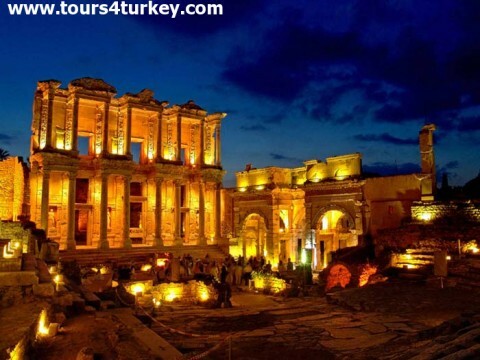 Ephesus Tour covers all the important sites of this ancient city. Temple of Artemis, Ephesus Ruins (Theatre, Celsius Library, Agora, Odeon, Domitianus Temple, Trajan Fountain, Roman Latrine). After lunch you'll continue to visit St. John, Museum and House of Virgin Mary where she is said to have spent the last years of her life visited by both Muslims and Christians. After the Ephesus Tour you will be transferred back to hotel for overnight stay. Tomorrow you will leave to Pamukkale. After breakfast at your hotel you will be picked up and you will get the bus from Kuşadası To Pamukkale. Our fully guided Pamukkale tour covers The ruins of the biggest Necropolis Graveyard of the ancient world, Roman Baths, Bazilica and calcium cliffs, after Lunch Red Spring. 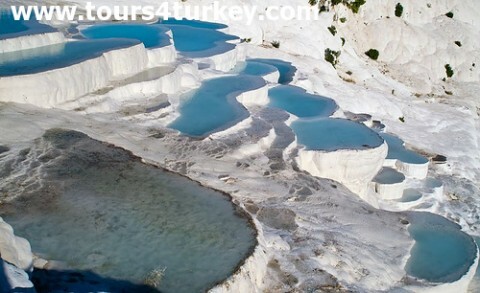 The unique calcium terrace and pools with hot spring water will amaze you during the tour on endless white path. You can swim in private Cleopatra Thermal Pool also. Please note: If you want to swim in Cleopatra pool you will need to pay an entrance fee there to the management . Our guide will assist you with that. After the Pamukkale Tour you two choices to go back to Istanbul, you can either be transferred to Kusadası and get an overnight bus back to Istanbul or get an overnight bus directly from Pamukkale to Istanbul. Please inform us of your choice. 2 Night Accommodation at 4 Star Hotels. Full day guided Ephesus and Pamukkale tours. Professional English speaking guide on tours. All transportation & transfers mentioned in the itinerary.